A fleetminder GPS tracker combined with the fleetminder “Live Tracking” system provides numerous features and benefits over and above “just the current location” of your vehicle (or asset). TRIP HISTORY and location data for up to 6 months. Allowing you to go “back-in-time” to view any day or time. VEHICLE / ASSET USAGE reports. Find out how effectively your business vehicles or assets are being used. DRIVER BEHAVIOUR REPORTS. Also know if your drivers have been speeding or driving roughly in your vehicle(s). BETTER ROUTE MANAGEMENT. See where all your vehicles (and assets) are and improve routing for drivers, reduce fuel costs and speed up customer delivery and service times. SIGNIFICANTLY IMPROVED THEFT RECOVERY. Even days after the theft you can see the track of when and where your vehicle (or asset) was stolen leading all the way to where it is now. EASY GEOFENCING. Able to “draw” geofences on the Google or Bing map. CUSTOM GEOFENCES of any shape and size using the geofence tool. UNLIMITED GEOFENCES since the geofencing function is now taken over by the software (rather being set on the tracker itself) you can set unlimited geofences for your vehicles and assets. SITES for easy report generation of fleet depot(s) or major customer locations. All these benefits are provided by your fleetminder tracker sending data to our secure server. The most common reports include: Activity, Customer Site, Geofence and Trip reports. The fleetminder Live Tracking reports can be after logging into the secure area here or by clicking on the “Login” link on the menu bar at the top of this page. This report provides users with information on events such as fuel level decrease, engine overheating, max fuel paddle, etc. for the selected vehicle and date and time range. The report also provides the speed and trip distance of the vehicle at the time of the event. The information about parameters of the ECU such as fuel usage, engine temperature, RPM etc. for the trips travelled by a vehicle is provided in this report. 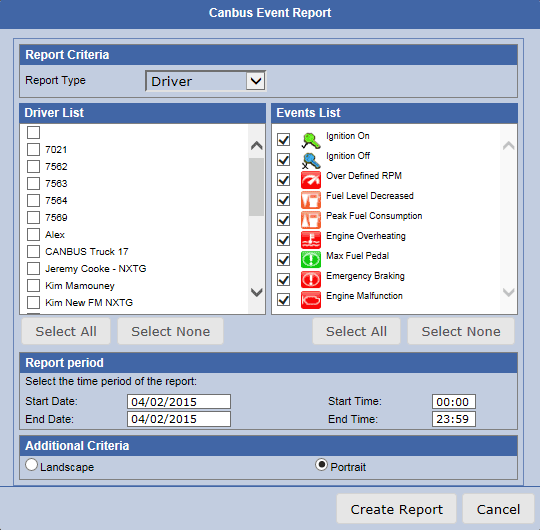 The report can be generated for selected vehicles for a particular date and time range. This report allows users to access data and generate a report for the triggering of events of one of the ECU parameters such as RPM overrunning, peak fuel consumption, fuel decrease, and engine overtime based on the value entered. With the help of this function, users can generate an incident report for a vehicle which provides information about the speed and RPM of a vehicle with respect to time for a particular date in the form of a graph for easy understanding and comparison. This report provides important information about the speed and RPM of a vehicle from the engine management system’s point of view. With the help of this report, users can analyse the engine temperature of the vehicle at different times of a particular day. The report is generated in the form of a graph for easy understanding. This function allows users to generate a report based on fuel level of the vehicle at different times for a particular date in the form of an easy to analyse graph. This report helps users to determine the efficiency of a vehicle and driver for a specific date and time range by providing data of ECU parameters such as trip distance, average speed, fuel used, etc. which are crucial in analysing efficiency.